INDIANAPOLIS (AP) — With All-Star guard Victor Oladipo out, new addition Wesley Matthews has helped the Indiana Pacers adapt. 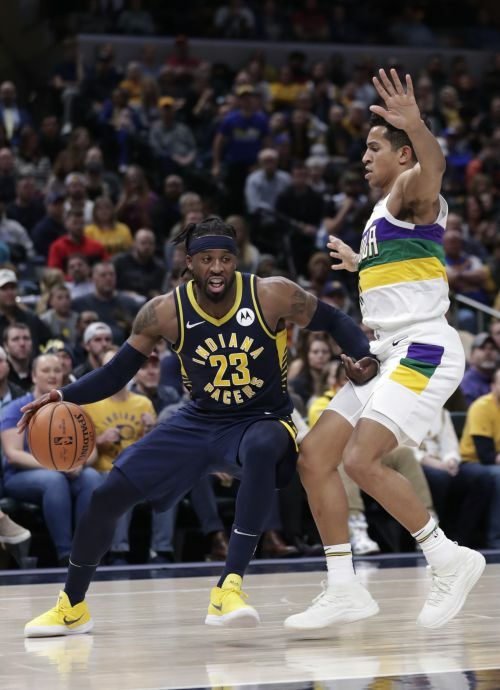 Matthews scored 15 of his 24 points during a third-quarter rally and the Pacers overcame a 20-point deficit to beat the New Orleans Pelicans 126-111 on Friday night. "What you saw was a team that looked like they had come off a break and was still on break for the first half," Pacers coach Nate McMillan said. "The second half, we came out there and started playing the basketball we're capable of playing." The Pacers also took advantage of a short night from disgruntled Pelicans star Anthony Davis. New Orleans interim general manager Danny Ferry said Thursday that Davis would see limited minutes the rest of the season while New Orleans focuses "on the future of the team." Davis played 20 minutes, getting 15 points, eight rebounds and four assists. It's unclear if he'll play against the Lakers on Saturday night. In his third game since being cut by the Knicks and joining Indiana, Matthews sparked a second-half surge when he drained a 3-pointer with 2.5 seconds remaining in the second quarter, cutting New Orleans' lead to 13 after it reached 20 a few minutes earlier. Indiana trailed 71-58 at halftime and didn't lead until Matthews' three free throws with 6:23 remaining in the third quarter. Matthews provided momentum for Indiana through the remainder of the quarter, setting up Tyreke Evan's 3-pointer with 3 seconds left in the third. Indiana took a three-point lead and never looked back. "We didn't come out with the right energy to start this game," Matthews said. "It was up to us to correct it in the second half." Domantas Sabonis had 18 points and 12 rebounds. Sabonis got his 23rd double-double of the season, and Bojan Bogdanovic added 20 points for Indiana. Six Pelicans scored in double figures, led by Cheick Diallo's 16 points. Julius Randle and Elfrid Payton each had 15 points. New Orleans outscored Indiana in the paint and on fast breaks, but the Pacers' performance in the final two periods overcame that. It was the first time Indiana won by at least 10 points after trailing by at least 20 since December 2015. "I don't think we played with the same energy starting the third quarter that we started the game with," Pelicans coach Alvin Gentry said. "We had a couple of plays that was such a momentum swing, a couple of layups here and there (missed) and they come down and make a 3-point shot. They're a really good team and they're going to stay in the game and continue to claw away at it." Davis has made it clear he won't re-sign with New Orleans when his contract ends after next season, so the Pelicans plan to scale back his usage. He still has to play, though, due to NBA rules that dictate healthy players must suit up, especially on the road and on national television. Pelicans: New Orleans' 71 first-half points were one point shy of its season high. ... The Pelicans are 0-17 on the road when they trail at the end of the third quarter. ... New Orleans blew a double-digit lead against Indiana in both meetings this season. Pacers: Myles Turner was ruled out with a bruised left hip. ... The Pacers are 36-7 when leading at the end of the third quarter. .... The Pacers had at least six players score in double figures for an NBA best 27th time this season. Pelicans: Host the Lakers Saturday night. Pacers: visit the Wizards Saturday night.